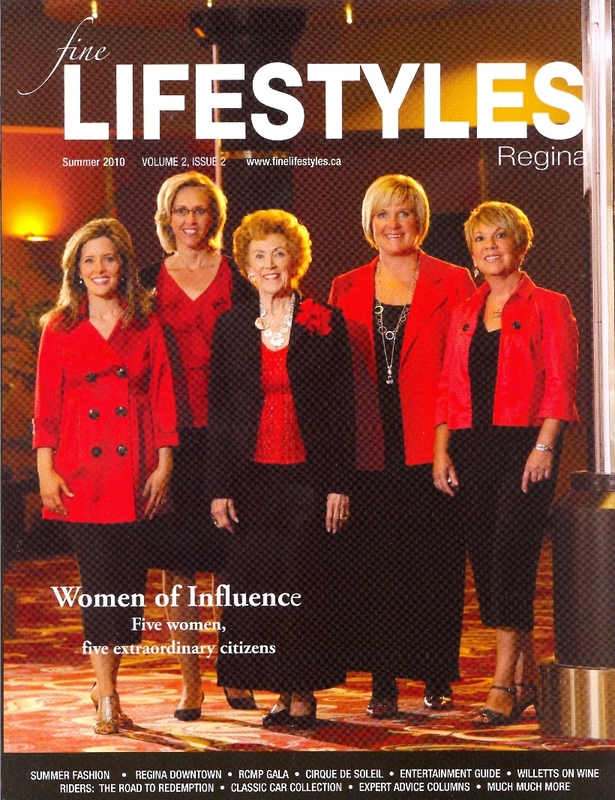 Here’s the cover story I wrote for the summer issue of Fine Lifestyles Regina, on five prominent women: Jacqui Shumiatcher, philanthropist; Susan Barber, lawyer; Darci Lang, motivational speaker; Janine Wilson, realtor; and Susan Minard, businesswoman. Enjoy! Every community is built by individuals, living their lives, reaching for goals, creating things, building things, donating time and effort and money to the causes they believe in. Here are five prominent women—a philanthropist, a lawyer, a motivational speaker, a realtor and developer, and a business owner—who are part of our community today: extraordinary individuals whose drive and vision have shaped and continue to shape this wonderful corner of the world we call home. If you enjoy the arts in Regina, you’re familiar with the name “Shumiatcher.” You may have attended a recital in the Shu-Box Theatre in the Riddell Centre, or a lecture in the Shumiatcher Theatre at the Mackenzie Art Gallery. Perhaps you’ve watched a play in the Shumiatcher Sandbox Series at Globe Theatre, and at intermission mingled with other playgoers in the Shumiatcher Lobby. Or maybe you’ve toured a display of sculpture in the Shumiatcher Sculpture Court at the Mackenzie Art Gallery, or enjoyed a concert in the Shumiatcher Pops Series of the Regina Symphony Orchestra. Jacqui Shumiatcher (nee Clay) was born in Vendin-le-Viel, Pas de Calais, France, in 1923. She came to Canada with her parents in 1927 and has lived in Regina ever since. “We lived on the north side, on the seven block of Robinson,” she recalls. “The city told us we would never have water there. We had to go and get the water from the well a block away, winter time or summer time. Jacqui attended Scott Collegiate, and after graduation worked in a number of positions, including as a teacher at Sacred Heart Academy. In 1955 she married Morris Shumiatcher (“Shumi”), counsel to Premier T.C. Douglas and adviser to the provincial cabinet from 1945 to 1949, who had gone on to practice law in Saskatchewan and B.C. She founded her own business, Managerial Services Ltd., to provide secretarial and managerial services to his law office. From the very beginning, Morris and Jacqui Shumiatcher were philanthropically inclined. “He and I were both of the opinion that we made our living here in Regina, and we should pay back to the community that supported us,” Jacqui says. Jacqui served on the executive of Regina Little Theatre, and as chairman of patrons, wrote letters to people urging them to donate. The Shumiatchers were also supporters of Globe Theatre from its beginning, and involved with the Regina Symphony Orchestra: Shumi was president and was also the RSO’s lawyer, and Jacqui was a member of the Ladies’ Auxiliary and later joined the board of governors. Among other things, she chaired or co-chaired various major events, such as the annual Symphony Ball at the Hotel Saskatchewan. New Dance Horizons, Juventus Choir, the Youth Ballet of Saskatchewan, Do it With Class Young People’s Theatre Co., Regina Lyric Musical Theatre, Prairie Opera, Opera Saskatchewan…the list of arts organizations that have benefited from the Shumiatchers’ generosity is almost endless. But as Jacqui sees it, the generosity cuts both ways. “When you get involved, and you see backstage, and everybody volunteering, it opens your eyes to all sorts of creativity of people at all levels. That itself is a real gift. We figure we’ve been showered with gifts by artistic people involved in all fields. Although the Shumiatchers collected (and Jacqui continues to collect) many different kinds of art, their collection of Inuit art is particularly fine. The collection grew and grew over the years. Morris Shumiatcher wrote for The Beaver magazine, which gave the Shumiatchers access to the The Hudson’s Bay House, the gallery of The Hudson’s Bay Company in Winnipeg, to which all Inuit Art was shipped from the north at that time. Many pieces (those not destined for the gallery) were purchased there. A portion of the Shumiatcher collection is on display at the Mackenzie Art Gallery (in the Shumiatcher Sculpture Court, of course) through February 27, 2011. “When we lend them, we miss them,” Jacqui says. A complete list of Jacqui’s accomplishments would be as long as this article, but notable honours include the YWCA Women of Distinction Award in 1996, the B’Nai B’rith Citizen of the Year Award in 1999, the Saskatchewan Order of Merit in 2001 and an honourary Doctor of Laws Degree from the University of Regina in 2002. She loves her home city of Regina. “What’s not to love about it? We’re very lucky because we have so many artistic people here, and they improve the city a great deal. There are so many events to which we can go, and it doesn’t take three or four hours to get there. I can do three events in an evening. Where else can you do that, and feel you had a good time at each one, that you didn’t miss out? “It’s wonderful having the library downtown, it’s always been very active in the community,” she continues. “When we were at our office at 2100 Scarth St. we would go to the main library downtown at noon and take a yoga class. Things like that, they’re little things and they’re little gems. “We should just open our eyes more. A lot of people walk around and their eyes are half-closed. They’re not aware, they’re in their own little world. They miss so much. For which fact, every Reginan should be grateful! It seems to have worked out for her. Today she’s a partner in McDougall Gauley LLP. She has been designated in the Canadian Legal Expert directory as a leading practitioner in labour law and listed in The Best Lawyers in Canada in the area of labour and employment law. She has acted as counsel for both unions and management in litigation and collective bargaining and is also a recognized arbitrator. She has rendered numerous decisions in labour disputes and human rights cases and has conducted investigations and made recommendations respecting workplace harassment issues. An active community volunteer, Susan was honored in 2000 with the YWCA Woman of Distinction Award in Business, Labour and Professions. In 2007 she was named a “Woman of Influence” in Saskatchewan Business Magazine, and that same year received the Community Service Award from the Canadian Bar Association, Saskatchewan Branch. She’s recently become chair of Information Services Corporation, which, among other things, administers land titles and the personal property and vital statistics registries in the province, and last year was also elected chair of the Board of Governors of the University of Regina. And if it seems oddly right that someone named Barber should be associated with the University of Regina, that would be because her father, Lloyd, was president of the university from 1976 until 1990. Susan was born in Seattle, Wash., while her father was going to university there, but she grew up in Saskatoon, where he was vice-president of the University of Saskatchewan, moving to Regina in 1976 when he became president of the U of R.
Susan attended Buena Vista Public School in Saskatoon, then Luther College in Regina from Grade 8 to Grade 12. She took all of her post-secondary education in Saskatchewan, as well, earning a B.A. in English at the University of Regina and attending law school at the University of Saskatchewan. Susan articled at McDougall Ready, and except for being seconded to the government in 1989, has remained with them ever since. The firm merged with Gauley & Co. in 2000 to become today’s McDougall Gauley. She’s also one of about 75 adjudicators to hear Indian Residential School claims and decide if the claimants are to be compensated, and how much. “That takes me all over western Canada,” she says. David Barnard, past president of the University of Regina, asked her to join the board of governors several years ago. More recently, she was asked if she would go on one of the boards of a Crown Corporation, which was how she ended up on the board of ISC. “I’m terrible at saying no,” Susan says. “I just always thought that you serve where you live. I think it’s probably a big part of my upbringing. My parents were always very community-minded. Not all of her involvement in community organizations has been at the level of university and Crown Corporation boards, either. Susan became involved very early on with the Royal Lifesaving Society, and was the first woman Commodore of the Regina Beach Yacht Club. Susan’s oldest brother is in real estate development, her next-oldest brother is vice-president of Dominion Construction, and her next-oldest brother owns a Bobcat dealership; they’re all in Regina. Her eldest sister is a nurse in Kamloops, while her younger sister is a stay-at-home Mom and lives in Texas. It’s a simple message that resonates: 90 percent of life is great; why not focus on that 90 percent? It’s a message she’s taken to heart…but more than that, a message on which she has based a very successful career as a motivational speaker, famous for her mantra, Focus on the 90%—the title of her nationally bestselling book. In Winnipeg that first summer after moving there, Darci got “a really neat job” at Mallabar. “I was mentored by some unbelievable men,” she says. The bank manager noted that she was always genuinely happy when she came to the bank, and his staff members were interested in her philosophy. Darci told him that she lived a mantra from a book she read as a teenager, Attitude is Your Most Precious Possession, that talked about holding a little magnifying glass out in front of yourself all the time, choosing what to focus on. As if a new tuxedo store and a new life as a motivational speaker weren’t enough, she also seized an opportunity to host a new bridal show, The Most Incredible Bridal Show, at the Saskatchewan Centre of the Arts (now the Conexus Arts Centre). So in the first year she lived in Regina, she opened three companies within three months. With the help of her assistant, Sandra Preikschat, Darci is continuing to develop her business. They’re working on enhancing her presence in social media, plus she’s writing a second book and is developing a four-CD series with a workbook, all based around Focus on the 90%. Darci says being from Saskatchewan “is marketable to everyone. You’re expected to be friendly and easy to deal with, and it’s true, I am, I only look high-maintenance. We just have a kind of gratitude and humility that people really, really appreciate. “And the fact that I am 41, I’m a working mother, that’s really marketable, too, because the majority of my audiences are working parents. Trying to be everything to everybody is something that rings true to a lot of people. It’s hard to talk about balance and focusing on the positive if you’re not living a life that’s congruent with theirs. Darci says her husband, Darren, is a 41-year-old with the energy of a 10-year-old boy. “We’re a fun-all-the-time family,” she says. “Every day has to have an adventure, excitement. “You have a small-town environment in the middle of the city,” she continues. “I really should live somewhere else because of my connection flights alone, but I would never leave Regina. Besides, I married a farm boy from Saskatchewan. I would never leave. It is the best city bar none in this country to live in. Janine was born in Daytona Beach, Fla., and moved to Yorkton with her parents when she was 17. “My Dad was Canadian. He wanted to move back home,” she explains. She lived in Yorkton until1994, working first with the Bank of Montreal, but getting into real estate in 1989. She also got married and had two children there, and it was having children that led her into real estate. She moved to Regina with her children in 1994, joining Home Life Crawford Realty – Crawford Homes as a realtor, and quickly got into new construction. “I had built two houses on my own before that,” she says. “I really like the new-construction aspect of real estate. It can make it so much easier. It gives you another option. If you can’t find what your clients are looking for in the re-sale market, you can build it for them. Janine says she remembers when she first moved to Regina that people told her “the first year’s always tough,” but, she says, “I never found that. I never had a tough year, really. I just kept adding dimensions. The condo projects she’s developed, she says, “are all different. They’re not cookie-cutter. There are bi-levels, bungalows and suites all mixed together. I didn’t just zero in on one type of person. My condo projects, anyone can live in.” That mixture of styles was so unique it posed a challenge: the land titles office had to figure out how to deal with something it had never dealt with before. “I never thought of that when I designed them!” Janine says. 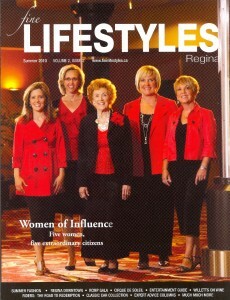 Janine’s daughter, Danielle, is also a real-estate agent in Regina, and mother to two sons, Janine’s grandsons. Her son, Devin, works for the New York Islanders in marketing and sales and lives in Long Island. “I stayed in Regina mostly because I was raising my kids here, now I’m staying because my grandkids are here,” Janine says. Regina had “everything” for her kids, she notes. “Both kids played hockey. My son played in the WHL and my daughter played university hockey. Hockey was a big draw, that’s what kept us in Regina. It’s a nice-sized city to do that in. And there’s great potential for even more, she thinks. “We haven’t seen anything yet,” she says. “I feel that there are at least another five to eight years of this steady growth still to come in Regina. “I think it’s about time,” she continues. “Regina has been lagging for many, many years, and I think Saskatchewan has a lot to offer. We’ve just been biding our time, and now that the economy is starting to turn around, Saskatchewan is going to be right there. Susan Minard admits she didn’t have any particular knowledge of the RV lifestyle when she started Minard’s Leisure World in 2004. But her father-in-law did. It whirled pretty well. In just six years Minard’s Leisure World has grown to be one of the largest RV businesses not just in Saskatchewan but in all of Western Canada, and has a growing string of awards to its credit: Kustom Koach Top Dealer in North America in 2007, three Top Dealer awards in North America from KZ Manufacturing, KZ Manufacturing’s Outstanding Service Award, and more. “It surprises me how quick it grew,” Susan admits. Susan was born and went to school in Weyburn. “I was raised on a farm with one sister (seven years older), and learned how to work hard, how to think for myself and how to be self motivated. Susan was also involved in music from an early age, eventually achieving her Grade 8 Conservatory in Piano with honours. “That taught me self-discipline,” she says. When Minard’s Leisure World began in 2004, it had a staff of five and sold travel trailers and fifth wheels from a single manufacturer. “Within two years we recognized the potential and the need for more floor plans and price ranges to suit our customers. We now have more than 16 different brand names to choose from and a staff of 30,” Susan says. In addition, Susan notes, the company recently developed a line of mobile office trailers that can be used for construction jobs, by oilfield consultants, or by anyone else who needs an “office on wheels.” Minard’s Leisure World is the exclusive Canadian distributor for these units. Susan has been married for more than 30 years to Gene Minard, “my full partner at work as well as home.” They have a son and a daughter, Chris and Lea, both of whom are working in the oilfield. Lea and her husband, David, are expecting their first child this fall, so Susan and Gene are excited about becoming grandparents. Susan bred, raised and trained champion collies for many years, and has collies in countries all over the world, including Germany, the U.S., Australia and Korea. “I was the top collie breeder in Canada in 2000 and 2002,” she notes. Susan says what’s most fulfilling for her in running a successful RV business is the chance to share that lifestyle with other families. “You’re dealing with people who are buying an RV because they want to enhance their life, slow down, relax, take time with family and friends and discover the beauty in nature that surrounds them in this province and beyond.